This is the second of two posts looking at the relationship between the religious life and secular life at Benedictine College. 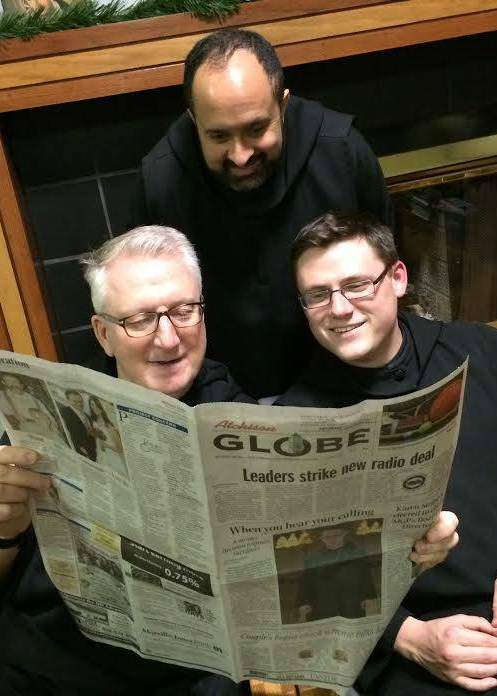 This one is an interview with Brother Luke Turner, a junior monk at the Abbey at Benedictine College, who joined after working as a senior vice president at MasterCard. You can read the other post here. You’ve had an interesting, unusual way getting to the Abbey. What is your story? I came to Benedictine for college, studying English and Spanish. I always loved literature, and the Spanish was because of my missionary zeal. 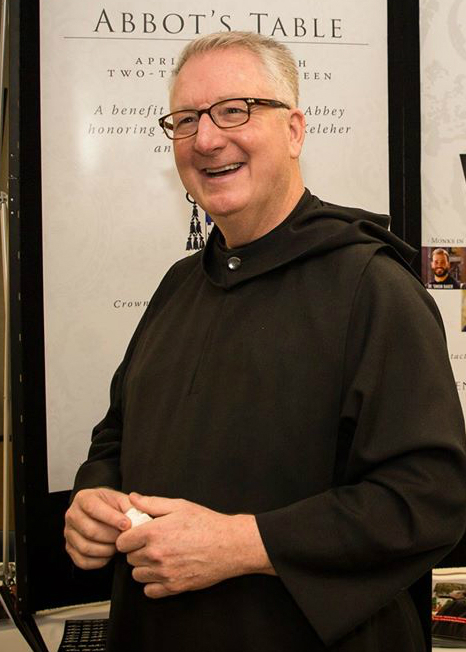 I started communicating with the vocations director, Father Regis, early on. I lived in Newman Hall with some of the other “Abbey students,” the ones considering going into religious life. Sophomore year I lived in the Abbey. I was still going to classes though. I entered the novitiate in August 1981, and took the name Luke. But I wanted a worldly experience before taking final vows, just to know I was making the right decision. My plan was to leave for a year and then come back and make my final vows. I transferred to Rockhurst in Kansas City, where I majored in Marketing. I figured that if I was going to be out in the world I should major in something that would make more money. Hallmark recruited me, and I worked travelling to stock Walgreens and CVSs with their cards, and then moving to work at their branch in Omaha, Neb. One day someone said to me, “You need a credit card!” “I don’t know anything about credit cards,” I said. So I went and got a job at a bank called First of Omaha. I went through their management program and moved up the ranks pretty quickly. Four years later I was doing the interface work for the bank, and I moved to MasterCard, where I became a senior vice president. They moved me to Chicago, then to Miami when they found out I spoke Spanish and wanted to send me to Brazil. In Miami I worked at eight locations, seven speaking English and one speaking Spanish. While I was there I was one of the people awarded with their global sales recognition. After Miami they moved me to headquarters in New York City. I loved the city, but I didn’t like working there – something about the atmosphere of working at headquarters. So in 2004 I asked to be transferred to our division in Dallas, Texas, and I loved it there. The Daughters of Charity were there, and they had this great St. Vincent de Paul center, and I decided to get involved and volunteer there. So I volunteered as an advisor for people with financial questions and as an aide for anyone needing clothing or anything like that. While I was working there, I started to think again about joining the religious life. I made the mistake of asking my friends and family to back me up on it, and they all told me I was crazy – that I had a good life, I had everything I could ever want, I was happy, why should I give that up. So I just kind of stopped thinking about it. Then MasterCard decided they wanted to move me to India, so I was relocated to Atlanta, Ga. in the meantime. Now I didn’t want to go to India, and I liked Atlanta, so I decided I would build myself a house in Atlanta, and it would be my last house before I retired – and I was only in my 40s at this point! – so then they wouldn’t move me to India. While I was there I joined St. Brigid’s Parish in Atlanta, and I wanted to get involved there, so I signed up for a Holy Hour on Friday nights at 9, because I knew I would be home from traveling most Friday nights. And that was where I heard the call to religious life again. But I thought God was talking to someone else, not me. I kept praying about it, asking for help, and I kept hearing it, until one day I heard God say to me that it was his wish, and that no validation was necessary. What’s your favorite religious life story? My mom means everything to me, though, and there is one story about her that has to do with the religious life. Four years ago, shortly after I came back to the Abbey, I was talking with the woman who does the health services for the Abbey. We were talking about my family history, and I had recently lost my dad to colon cancer. The woman asked when I’d last had a colonoscopy and I said it had been a couple years, and she suggested I have another just to establish a base line. So I went in, and I was actually diagnosed with cancer. I had just sold everything, left my whole life behind, and now I had cancer, so I had a long conversation with God about it. It was a huge psychological blow. And I had just lost my dad to it, so I didn’t want to tell my mom until after I had the chemotherapy and radiation lined up. So afterwards, when I had everything arranged with the hospital, I called my mom and told her, and she said, “We raised you well, in God, so I want you to promise me something. I want you to promise me that when you go in for your treatment, you won’t show on your face why you’re there. I want you to be strong at the hospital.” So I said okay. Now I always wore my habit to the hospital, of course, and when we go anywhere we always bring someone with us. So after I’d been going in for treatment for a few months and the cancer went into remission, I didn’t go back for a while, and after about a month I just went in for a follow-up. I walked in and the nurses said, “Oh, Father, we were wondering where you’ve been! You used to come in all the time but we haven’t seen you!” “Well, you know, I was coming in for treatment, but the cancer’s gone, so I haven’t had to come in.” “Oh! We thought you were the chaplain!” So I called my mom and told her, “See? I was strong. I didn’t show it on my face.” And she said she was proud of me.